If you're looking for latest trends in sports marketing then Sports Geek is the podcast built for sports executives. Sports Geek is listened to by sports marketing and technology executives in USA, Europe and Asia Pacfic. Sports marketing leaders like Bryan Srabian, Dwayne Hankins and Richard Ayers have been discussing digital marketing campaigns, fan engagement strategies and sports social media. If you're looking for a new marketing podcast with a fresh take on how your sports teams uses digital channels then look no further. Sean Callanan interviews with a sports digital marketing and sports business professionals from US, UK and Australia. Stay in the know so can help you deliver great results to the most important people, your team's fans. Find out what is happening on the latest social media platforms and what teams are doing to engage fans and more importantly drive business results from your digital channels. Latest takes on developments in digital and technology as Sean chats with technology providers looking to deliver the connected fan experience. 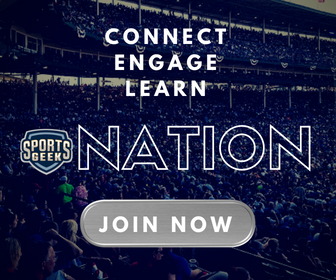 Please connect with the Sports Geek Podcast listeners on Twitter and via #SportsBiz Slack to continue the conversation. Sports Geek is available on Apple Podcasts, Google Play, Stitcher & Pocket Casts, please let us know if you are having trouble accessing the podcast. Sports Geek Podcast is hosted by Sports Geek's own Sean Callanan. Sports Geek Podcast listeners span the globe with downloads from over 100+ countries clocking up over 300,000 downloads that feature interviews with sports business professionals from EPL, NBA, NHL, MLB, MLS, AFL, NRL and NCAA. Started in 2014 the Sports Geek Podcast has gone from strength to strength thanks to the quality of guests on the podcasts, if you are new to the podcast please check out our archive with over 200 guests representing over 100 sporting organisations. With over 110+ iTunes reviews globally we have been humbled by the response to the podcast and the feedback from the sports business and sports marketing community is the primary reason the podcast thrives. Are you interested in advertising on Sports Geek Podcast? Reach sports business executives around the world. Please contact us. New to Sports Geek? Check out what you've missed so far. A quick guide for PR staff to learn more about Sports Geek.